Amid a new spike in Ebola cases in Guinea, Ebola Response partners organized an urgent mission to Boké, the latest epicentre, which is close to the border with Guinea-Bissau, to meet with local authorities and discuss a containment strategy. The World Health Organization (WHO) today reported “a substantial increase” in the weekly total of new Ebola cases in Guinea and Sierra Leone and deployed a response team to the border with Guinea-Bissau because of its proximity to a recent cluster of cases in a neighbouring Guinean prefecture. Also in health news, WHO announced that its governing body meeting in Geneva, Switzerland, today agreed a new malaria strategy for 2016-2030 to reduce the global disease burden by 40 per cent by 2020, and by at least 90 per cent by 2030. It also aims to eliminate malaria in at least 35 new countries by 2030. “Between 2000 and 2013, the global malaria mortality rate dropped by 47 per cent,” according to the WHO announcement. “Nevertheless, millions of people are still unable to access malaria prevention and treatment, and most cases and deaths continue to go unregistered and unreported.” In 2013, malaria killed more than 580,000.
WHO member States also approved the health agency’s budget for 2016-17. The budget of nearly $4.4 billion includes a $236 million increase over the current programme budget requirement to meet the needs of countries; leverage the experience gained during the Ebola outbreak; and address emerging priorities such as antimicrobial resistance, health and the environment. In its latest update outbreak in West Africa, which has affected nearly 27,000 people with more than 11,000 deaths, WHO reported that the week ending on 17 May saw the highest weekly total of confirmed cases of Ebola in over a month, with 35 cases reported from Guinea and Sierra Leone. Guinea reported 27 cases, compared with seven the previous week. “This is a substantial increase compared with nine cases reported the previous week,” the update said. “The geographical area of transmission has also expanded compared with recent weeks, with a total of six districts reporting cases (three in Guinea, three in Sierra Leone), compared with three the previous week (three in Guinea, one in Sierra Leone),” it said. Guinea Bissau has so far not reported any Ebola cases. “The cases in Boké were tightly clustered in the coastal sub-prefecture of Kamsar, and initial investigations suggest they may have originated from a chain of transmission in Conakry,” according to the update. WHO said although the exact origin of the cluster in Boké is unknown, an investigation has linked most of the confirmed cases to four probable cases who attended a funeral of another probable case in mid-April, which may have been the source of the outbreak. “Difficulty engaging local communities has made case investigation and contact tracing in the area challenging,” it noted. 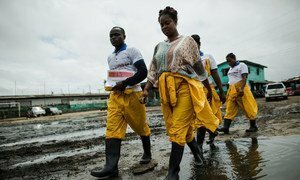 The World Health Organization (WHO) has declared Liberia free of Ebola virus transmission as forty-two days have passed since the last laboratory-confirmed case was buried on 28 March, a “monumental achievement” for a country that reported the highest number of deaths in the largest, longest, and most complex outbreak since Ebola first emerged in 1976.